Olivia Greenspan and Avery Lewis will attend the Huron Senior Prom tonight at Michigan Stadium. Photo by Jo Mathis. 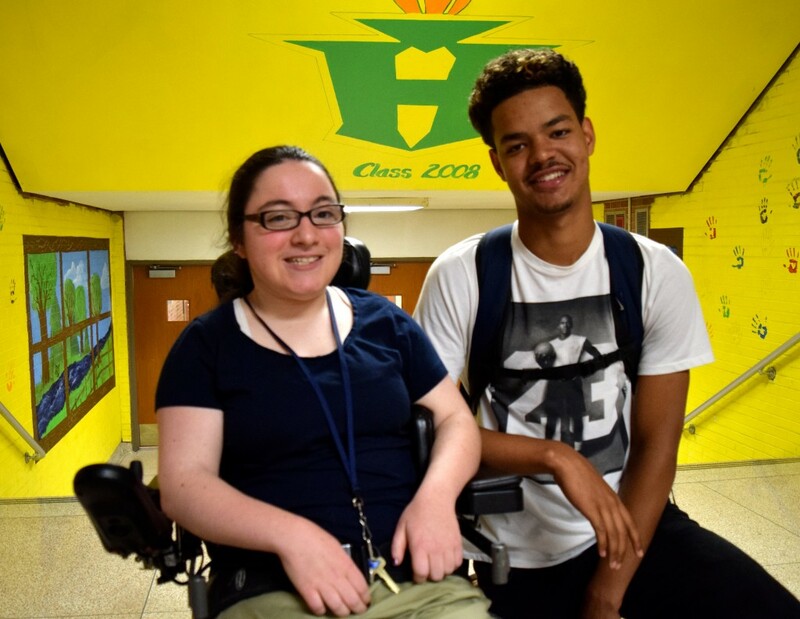 Olivia Greenspan says she’s enjoyed a wonderful four years at Huron High School, and that it will be great to top it off by attending the senior prom. But she didn’t have a date to tonight’s big bash—until two days ago. That’s when her teacher’s aid asked a coach if there might be an athlete who would do the honor of accompanying Olivia. Coach Michael Lewis knew just the tall, handsome basketball player to fill the bill: his son, Avery. Because Olivia uses a wheelchair due to cerebral palsy, there might not be a whole lot of dancing. Then again, there might be a lot of dancing. “It’ll be a learn-as-we-go process,” said Olivia, 18, with a laugh. “I agree with that,” added Avery, a sophomore who is able to attend the prom because he’ll accompany a senior. Avery said he happily agreed to take Olivia to the prom when his dad asked, although the two had never met. “Everybody should have a prom experience and take pictures with somebody and not go alone,” he said. Olivia borrowed a purple dress and Avery will wear a black tux to the dance. Olivia’s parents will drive her there and pick her up later. Olivia said she wasn’t sure if she wanted to go to the prom. Thanks in part to her teacher’s aid, it’s happening. “I’m really excited that it’ll be at Michigan Stadium,” she said, noting that she’s never been in the Jack Roth Stadium Club, where the prom is held overlooking the field. Avery is also looking forward to the big night. I now have a new favorite basketball player (teacher’s aid and dad). Way to be, Avery. Have so much fun, Olivia! Thanks for sharing this warm hearted story!